Note: Hadoop is deprecated for use with DataStax Enterprise. DSE Hadoop and BYOH (Bring Your Own Hadoop) are also deprecated. The use case is a financial application where users can actively create and manage a portfolio of stocks. On the Cassandra OLTP (online transaction processing) side, each portfolio contains a list of stocks, the number of shares purchased, and the purchase price. The demo's pricer utility simulates real-time stock data where each portfolio updates based on its overall value and the percentage of gain or loss compared to the purchase price. This utility also generates 100 days of historical market data (the end-of-day price) for each stock. On the DSE OLAP (online analytical processing) side, a Hive MapReduce job calculates the greatest historical 10 day loss period for each portfolio, which is an indicator of the risk associated with a portfolio. This information is then fed back into the real-time application to allow customers to better gauge their potential losses. The default install_location is /usr/share/dse. Go to the Portfolio Manager demos directory. The pricer utility takes several minutes to run. Open a browser and go to http://localhost:8983/portfolio. 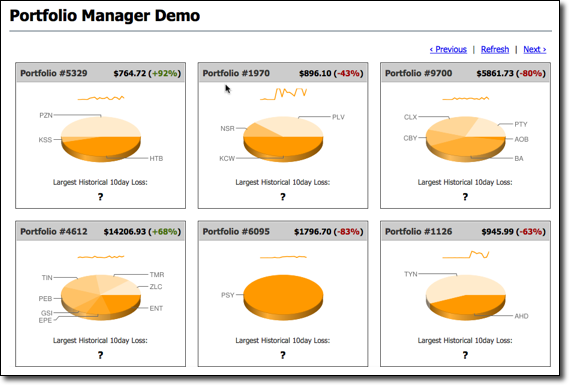 The real-time Portfolio Manager demo application is displayed. Start Hive and run the MapReduce job for the demo in Hive. The MapReduce job takes several minutes to run. To watch the progress in the Job Tracker node, open the following URL in a browser. After the job completes, refresh the Portfolio Manager web page. The results of the Largest Historical 10 day Loss for each portfolio are displayed.